Practicing at home is an affordable alternative to range training. When playing golf, attempting to make changes to your swing while out on the course is often a recipe for further frustration, as a round does not provide the volume of shots needed for adjustments, and every growing pain in adjusting is reflected on your score. Unfortunately, getting to a range is not always an option and can add up financially, making home training a great alternative. Whiffle balls may be more familiar to many people as plastic baseballs, but Whiffle-type golf balls are also available. Whether they are a solid, hollow plastic shape, a plastic ball with holes, akin to Whiffle baseballs, or small plastic cores with foam padding around them, all these balls operate on the same principle. Being so lightweight, the balls are quickly stopped by the air, allowing the golfer to hit the Whiffle ball at full power without it traveling very far, allowing for full swings in even a short yard. Golf nets are a great option for those looking to take full swings while also getting the realistic response that a Whiffle ball can not provide. Nets can be simple designs featuring a single vertical net with slack to stop the ball, or long cages like a baseball batting cage. When using a net, a player can still take a full swing, even with a real ball, without damaging their house or their neighbors', as the net stops the ball shortly after it leaves the club face. Putting is the easiest part of the game to practice away from a range or course, as a short carpet can be used to fairly accurately simulate a putting surface, and any non-shag carpet will allow a player an accurate representation of their alignment at short distances, allowing the player to determine if he is hitting the ball squarely and down the target line. 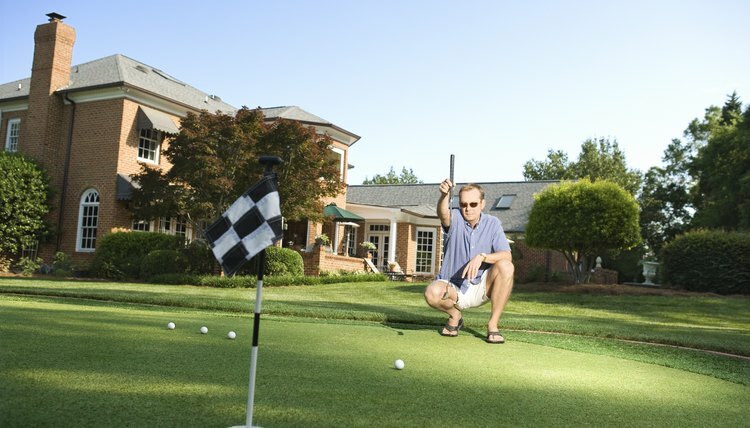 For players without a suitable surface available, putting mats, which can be rolled up when not in use, can simulate a putting green. There are many different training aids available, each promising to cure one of the many different swing problems that can befall a player. It is important for a player to properly research before purchasing an aid to ensure that it can deliver the promised improvement. Aids can range from simple items such as braces that can be worn onto the course, to training-specific aids like the Medicus practice clubs, which feature hinges that bend if an improper swing is taken. What Are the Benefits of Golf Simulators?